First of all, congrats for a very interesting product. THe board looks very good from a specs. point of view, but what about the power consumption? How much power does it need in idle and how much power does consume under full load? (07-26-2017, 09:29 AM)arevenco Wrote: First of all, congrats for a very interesting product. ... time to get a board and find out ! You'll find that the boards are very efficient; but the SoC(s) do get warm; you'll want at least passive cooling on them. there is a reason that the rock64 power supply units in the store are 3Amp with barrel jacks while the pine64 board power supply are 2Amp with micro usb plug. rock64 uses considerable current compared to many other sbc. (07-27-2017, 03:45 AM)dkryder Wrote: there is a reason that the rock64 power supply units in the store are 3Amp with barrel jacks while the pine64 board power supply are 2Amp with micro usb plug. rock64 uses considerable current compared to many other sbc. ... the reason for the increase in the size of the power supply and the use of the barrel jack are for two completely different motivating purposes. The barrel jack connector is the standard (new) method for providing power to pine products; the micro usb connectors are insufficient even for the pine boards; secondly the increased power supply is provided because the cap on the output current of the usb ports is higher, not because the Rock64 boards actually need that much current now. If you add up the current allowed for each usb2.0 port (600ma) and the current allowed for the usb3.0 port (950ma) you'll see why the power supply was changed. The board is actually very frugal; although, the SoC does get warm-- the power dissipation is nominal for this board in comparison to other SoC(s) SBC(s). The reason for the 3A power supply is because that pine64 is standardising on the 3.5x1.35mm (IEC type H) barrel jacks instead of microUSB for two main reasons. The first is that the microUSB connector is only spec'd to handle 1.7 or 1.8A (think it's the latter). So a 2A or more power supply would be stupid in that case. The second it because of crappy microUSB leads with power lines about as thick and as useful as a human hair. Resulting it massive voltage sag when the power is needed, causing instability and data corruption. So, they have moved the the 3.5x1.35mm connector and a single PSU (with a USB to DC cable as an option also). 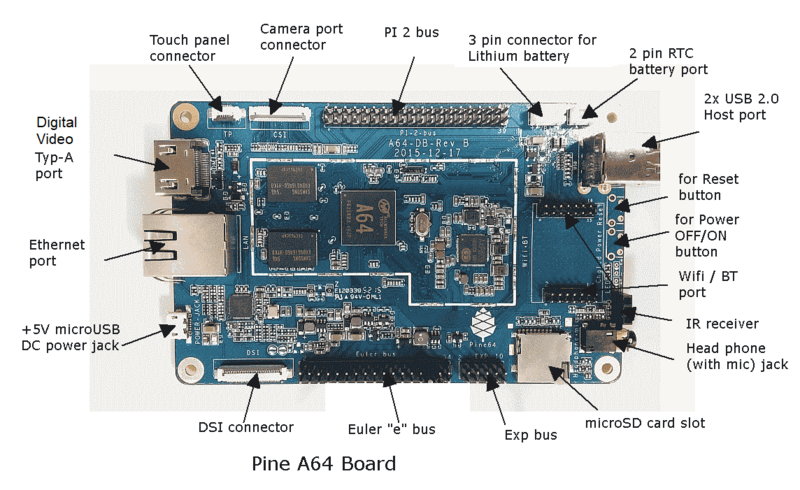 Which is used by the pinebook, rock64, sopine base board, and the upcoming LTS version of the pine64, plus any other boards they come out with. Why 3A? Because whilst the pine64 and rock64 on their own don't need that, if you have pheripherals pulling power from the rock64/pine64, it obviously needs a bit more. And whilst the pinebook only draws around 1.8A, that just means the power supply isn't being run flat out, so doesn't get seriously hot like a lot of others do. if that is the case hook up the rock64 to 2Av supply and work with that. since 2A barely is enough to power the pine64 by itself even using the pins as a route, it stands to reason that in order to avoid boot issues on the rock64 they made the decision to go to 3A. it is nice to know that the micro usb is gone. but in moving to barrel they made the decision to use a cheap 3.5x1.35 barrel instead of the more frequently used 5.5x2.1. so yeah now that you two are on record that 2A is plenty, i expect to see nothing but 2A recommendations for power from here on out from you two. (07-28-2017, 03:30 AM)dkryder Wrote: if that is the case <snip> ... so yeah now that you two are on record that 2A is plenty, i expect to see nothing but 2A recommendations for power from here on out from you two. The reason for NOT recommending only 2A on either board is that spikes (particularly at bootup) and peripherals require more; dongles of all types, gpio(s), active cooling, etc. The recommended PSU is NOT for the board only (per se), the recommended PSU is for the normal use case(s) for the board including loading, peripherals, and other current losses including but not limited to gpio(s) , fans , usb receivers , etc. And another thing; as most of us know, the SoC is not a static entity; faster clock = more current, more cores active = more current, etc. You never pic a PSU based on zero load and idle ! You choose a PSU based on expectations across a range of use case scenarios, including buffers for spikes and extremes. (07-28-2017, 07:39 AM)MarkHaysHarris777 Wrote: The reason for NOT recommending only 2A on either board is that spikes (particularly at bootup) and peripherals require more; dongles of all types, gpio(s), active cooling, etc. The pine64 had some very nasty power on spikes which IIRC went up to maybe as hight as 2.1A... but I suspect the rock64 isn't quite as spiky as the pine64. (07-28-2017, 03:30 AM)dkryder Wrote: if that is the case hook up the rock64 to 2Av supply and work with that. since 2A barely is enough to power the pine64 by itself even using the pins as a route, it stands to reason that in order to avoid boot issues on the rock64 they made the decision to go to 3A. it is nice to know that the micro usb is gone. but in moving to barrel they made the decision to use a cheap 3.5x1.35 barrel instead of the more frequently used 5.5x2.1. so yeah now that you two are on record that 2A is plenty, i expect to see nothing but 2A recommendations for power from here on out from you two. Just for giggles, I just plugged it into a 1A USB powerbank and it booted up fine (twice in a row)... and the highest I current I saw drawn during boot was 590ma (0.59A). I won't run the cpuburn this time since I don't need to push the powerbank right to the edge... It was nice to see Panasonic did the right thing with this one though... it's outputting 5.1v instead of 5.0v So based on that, I would have no qualms with a proper 5.1v /1.5A PSU for the rock64 on it's ownsome, or work a wireless mouse or flash drive perhaps. If you have any other peripherals (USB powered external HDDs, high power wifi, etc) then we're looking at 2-2.5A minimum again. And I believe Pine primarily opted to not use the 5.5x2.1 barrel because it is more often used for 12v power than 5v, so there's no need to make it easy for someone to plug in a 12v PSU (or just the wrong one) and blow up their pinebook / rock64 / sopine + any other peripherals they happen to have connected. Because people will do that, and then complain that the connector should have been different. So they're damned whichever way they go... they just opted for the smaller connector which is also readily available. yeah, but following that logic you would have read many reports in the forum of pumping 12V or 9V through the pins fried the board. using the bigger barrel increases the contact area between the barrel and the jack by ~ 30 - 40 percent. it was essentially a cost decision, ask tllim he probably did not give much consideration if any the the smaller jack decreases overvoltage chances. many users will make a diy larger jack to smaller barrel which totally negates any over-voltage protections. how many power supplies with that size barrel have you seen? i've only seen pine64 power supply. that size barrel is not that common at all in the u.s.a. name 3 other sbc that use it? Spec at 3A due to USB 3.0 950mA consideration. if not worry about plug in USB HDD, 2A should be sufficient. About the 5.0mm/2.1mm barrel jack vs 3.5mm/1.35mm barrel jack debate, just imagine that some Arduino user plug in their 9-12V power supply to ROCK64 board and ask support team for DoA replacement. Another consideration of using 3.5mm/1.35mm jack is this allows ROCK64 board fit into Raspberry Pi case without modification. BTW, decide on 3.5mm/1.35mm barrel jack still better than 4.0mm/1.7mm that some board vendors used. Just search at Amazon or eBay, there is no lack of seller that carry such 3.5mm/1.35mm jack power supply or cable. For sure that we also need to take Pinebook into consider and standardize into only one type. Current time: 04-19-2019, 07:15 AM Powered By MyBB, © 2002-2019 MyBB Group.